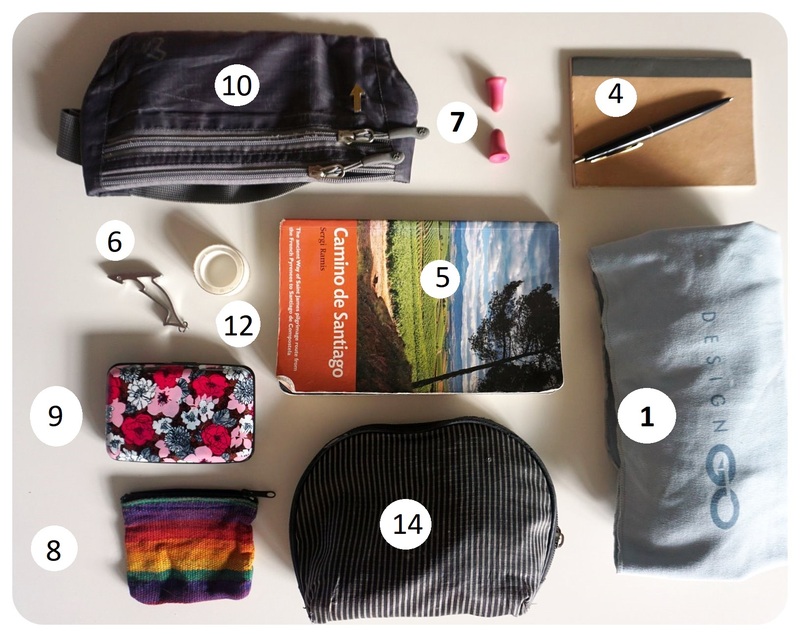 When I started planning my 500 mile hike along the Camino de Santiago, I wanted to make sure I’d be as prepared as I could be, to ensure I’d have everything I’d need to make it to the end. But I also knew I’d need to pack as light as possible – something I am not very good at. Even one or two kilos can make or break a hiking trip, considering you will have to carry your own pack from place to place (even though it turned out I could have avoided carrying it, but more on that later). Since I’d never gone on a five-week hiking trip before, I consulted every blog and website with travel tips & resources I could find, making notes on what equipment to buy and which brands were recommended. If you are a serious hiker, you’ll probably have heard of Compeed, a popular blister bandaid brand. My sister, who works at a pharmacy, brought me three different kinds of Compeed, and thank God I didn’t need a single one of them! I gave a couple of them away, and of course I held on to them in case I’d develop a blister, which luckily I didn’t. Since I saw Compeed bandaids in every single pharmacy along the Camino (I am sure they’re making most of their sales here), I wouldn’t buy them before the hike next time, and instead pick them up along the way if needed. People do swear by them though, so if you’re prone to getting blisters, you might want to bring a pack (they’re small and very light). Well, I am a bit torn about this one, since I guess I could’ve had it much worse. 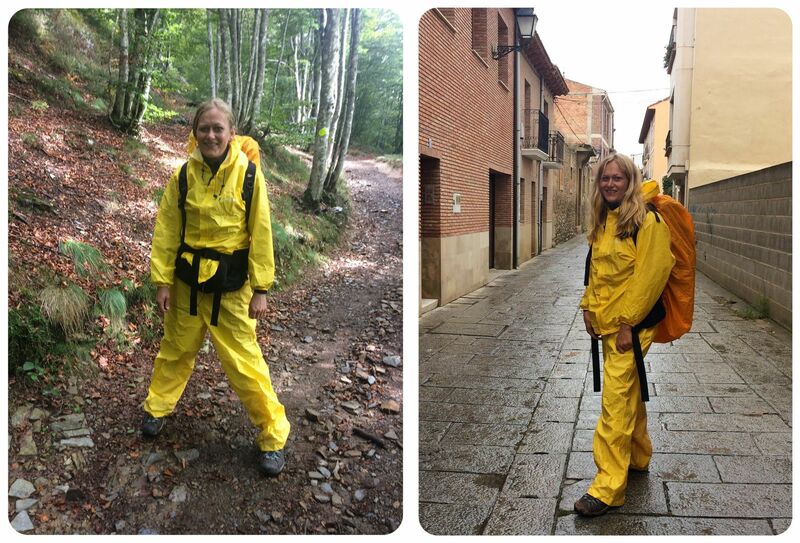 I ended up using my amazing Frogg Togg rain outfit only twice throughout the entire walk, on my first day in the Pyrenees and on Day 9 when I walked from Najera to Santo Domingo, but I kept the gear despite the summery temperatures in September because I was told Galicia could be quite rainy and I was afraid I might end up walking a couple of days in heavy rain towards the end of the trip. The reason why I’m torn about thinking I could’ve done without this gear is because the pants and jacket (both worn over your normal gear) did serve me very well when it did rain, and since my legs didn’t get wet at all, I wasn’t freezing in the rain like some other hikers who only had a poncho, and whose pants and shoes got soaked. But then a rain poncho, worn over your clothes, would’ve been lighter and would have taken up less space in my backpack. I think it would be dependent on what time of year you’re doing the Camino: if you do it in October/November, then they’re definitely a good investment (the set is around $20). I brought a small travel-sized mosquito repellent which was definitely not needed – the bottle is still unopened. I met some people along the way who claimed they were covered in mosquito bites but I started wondering if they were bedbug bites. Almost every hiker brought a small, lightweight sleeping bag, which you need in the pilgrims hostels. They only provide a sheet – sometimes not even that – and a pillow (often without a pillow case) and so you have to provide your own sleeping bag or alternative. 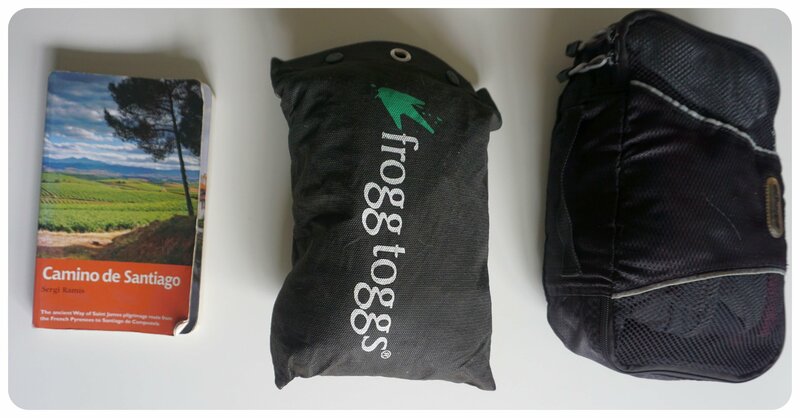 I only had a cotton sleeper, which I thought would be lighter and smaller than a sleeping bag, but seeing everyone’s tiny sleeping bags I figured it wouldn’t really have made a big difference. There were a couple of nights it was a bit chilly, which is when I wished I’d brought a sleeping bag, but most nights I was hot in my sleep liner and usually the hostels provide an additional blanket. Since most people complained they were sweating in their sleeping bags, I am not sure if I would’ve been happier with one. I guess I’d also say it depends on what time of the year you’re planning to do the walk. In the summer months, a sleeping bag liner would definitely be enough. 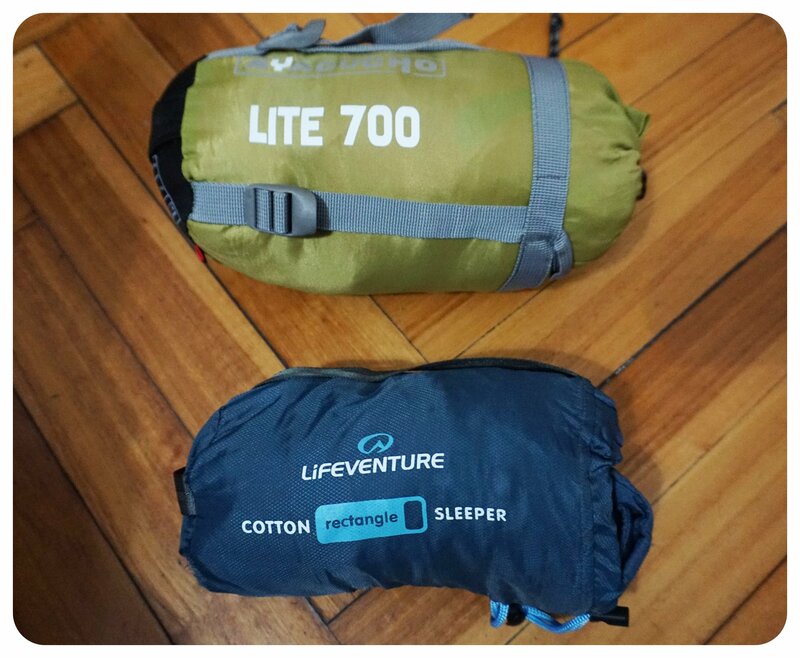 Cotton Liner vs. Sleeping Bag – the sleeping bag is not all that much bigger. In the first week of the walk, there were a couple of cold mornings and evenings that made me think I’d have to pick up a fleece along the way. One fellow pilgrim had a super lightweight Uniqlo down jacket that I wished I had – but honestly, there were only a couple of days when I could have needed it and I was never freezing with my windbreaker and one long-sleeve running shirt I had brought. Layering up with a tank top, my long-sleeve top and my windbreaker jacket was absolutely enough, so I am not sure if the very few cold mornings would’ve justified the additional weight and space in my backpack. If you have your backpack transported for you (see below), however, and don’t have to worry about extra space and weight, I’d recommend bringing one, especially if you are walking in the spring or fall when temperatures are lower. I assumed I’d pick up at least a light pashmina scarf along the way, but it started getting warmer instead of colder towards the end of September, which is why I ended up not needing one. I lost mine last year and still haven’t replaced them, and I was fine without them, but some of my fellow pilgrims told me they wouldn’t have made it through the meseta (the central plateau), where often you don’t find any shade for hours, without their sunglasses. I guess it depends on how sensitive your eyes are to bright sunlight. Hiking poles are very popular on the Camino – so much so that each hostel has a box where everyone is supposed to store their poles. I personally am not a big fan of hiking poles because I feel they limit me quite a bit (I take a lot of photos or fiddle around on my phone… in these situations you always have to figure out what to do with your poles) and I tend to forget things, so I figured I would’ve left them behind in a hostel or a bar along the way sooner or later. There were a couple of mountains where I think they’d be helpful, but I was more than fine without hiking poles, and my knees never hated me for not using poles. 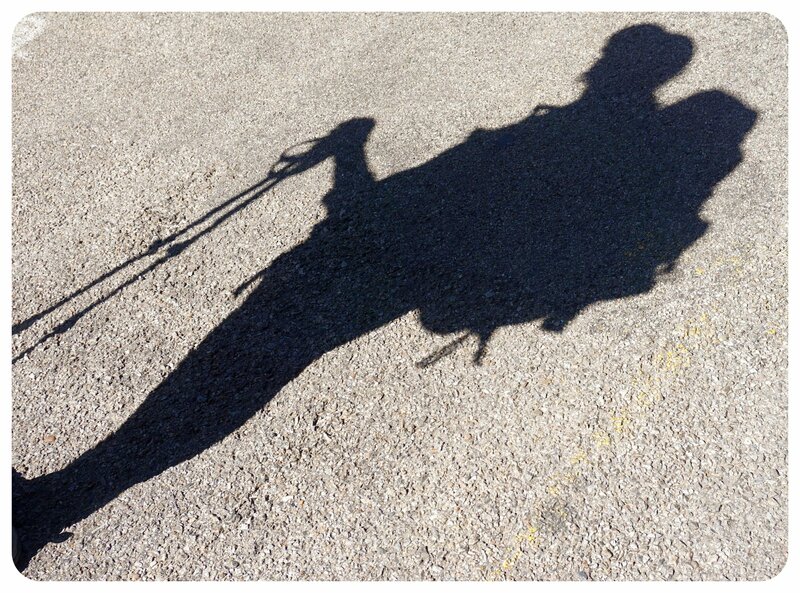 If you have sensitive knees, however, I highly recommend bringing hiking poles – choose light weight and collapsible ones which you can attach to your backpack when you’re not using them. 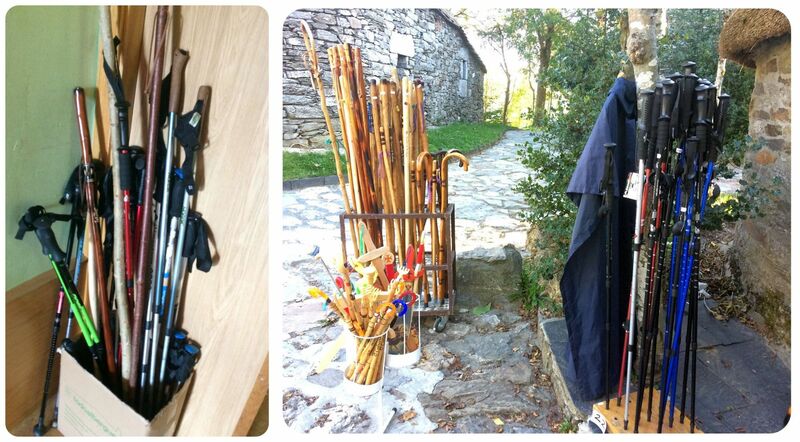 And if you are not sure if you’ll need hiking poles – don’t worry about bringing them from home, they’re widely available along the Camino. The same goes for a hat – several hikers commented on me not wearing a hat to protect me from the sun, but I sweat easily under a hat, so I didn’t bring one. But I know that some people’s skin is much more sensitive to the sun than mine, with many people at least needing a visor cap, but I was fine with just using sunblock. I was one of very few people who didn’t have a headlamp – but I never needed one. When I needed to go to the bathroom at night and make my way through the dark, the flashlight on my iPhone was all I needed. Me and my hiking buddy were, however, one of very few people who waited to start our day’s hike until sunrise – most people leave in complete darkness, as early as 6am. The sun rose later and later throughout the month, in the end around 8.15am – 8.30am. I have absolutely no idea why 90% of pilgrims head out in the pitch black darkness – not only can you hurt yourself easily, but you can not see anything! For me this hike was all about taking in the beautiful scenery, and every day when we set off I was so in awe of the landscapes around me that I asked myself over and over again why people decided to consciously miss out on these views, and going on night crawls instead. There was no reason to leave early because of the heat in September – it just wasn’t very hot. Considering most people cover 20km a day, which takes four to five hours, this means the majority of their hikes was absolved in darkness. It still baffles me. However, me and my hiking buddy were two of the very few people who waited to start their day’s hike until sunrise – most people leave in complete darkness, as early as 6am. 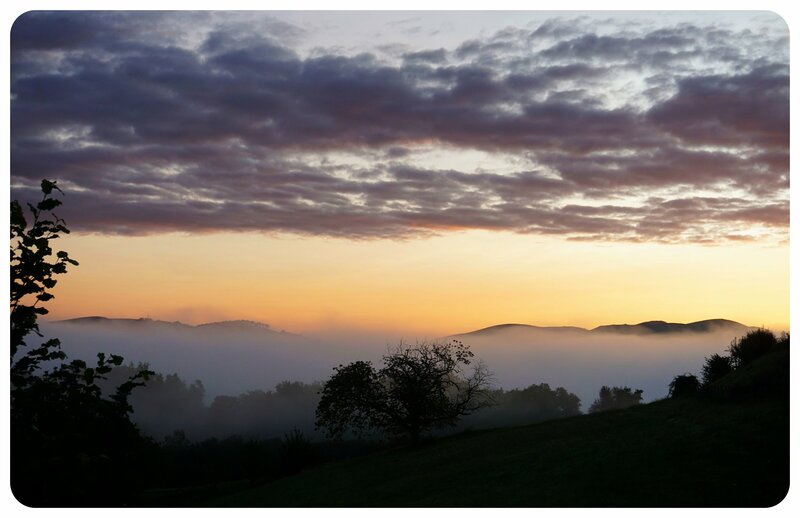 The sun rose later and later throughout the month, in the end around 8.15am – 8.30am. I have absolutely no idea why 90% of pilgrims head out in the pitch black darkness – not only can you hurt yourself easily, but you can’t see anything! For me, this hike was all about taking in the beautiful scenery, and every day when we set off I was so in awe of the landscapes around me that I asked myself over and over again why people decided to consciously miss out on these views, hiking in the dark instead. There was no reason to leave early because of the heat – in September it just wasn’t very hot. Considering most people cover 20km a day, which only takes four to five hours, the majority of their hike was in darkness. It still baffles me. That said, if you’re planning to walk pre-sunrise or don’t want to rely on your phone as a flashlight, a headlamp will come in handy. This was my first ever trip without my dSLR camera, and I have to admit that it was very hard for me to leave it behind. However, since I was bringing my laptop (for work reasons – you really don’t need it if you won’t be working during the hike) I needed to cut weight in other places. My Canon is heavy and bulky and I always bring a zoom lens, so I knew it’d be too much extra weight for this hike. 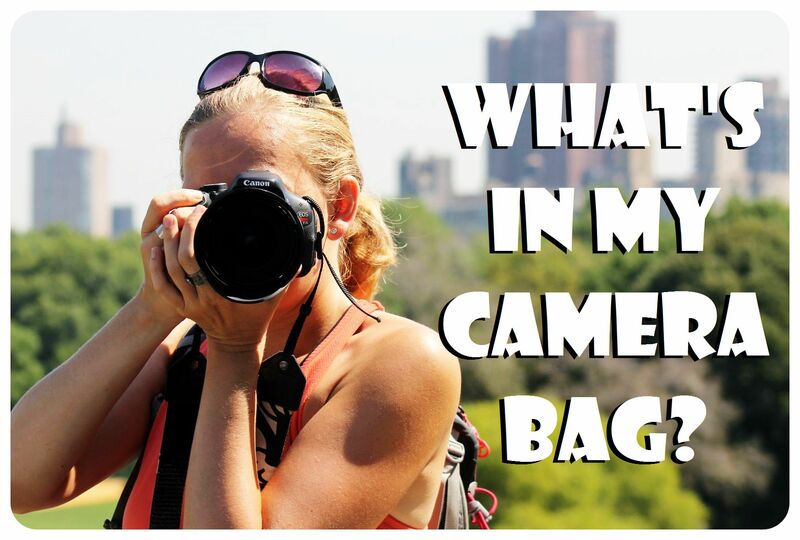 Other hikers I met along the way did have dSLR cameras with them – but they were usually sending their backpacks with all their stuff ahead (see below). I brought a mirrorless camera instead (Sony A6000) which was enough for me: not once did I miss my dSLR. Mirrorless cameras take pretty good pictures these days, and a lot of people compare the quality of the images to those of dSLR cameras. If I went on the hike again, I would not bring a dSLR camera. Most people didn’t even bring a camera but only used their phone, and with the latest generation of smartphones, I don’t think you’d sacrifice much if you didn’t bring a camera at all. The only reason I brought a good quality mirrorless camera was because I knew I’d be publishing some of my images. I only found out about sock liners while I was doing my research for the Camino, and since several bloggers were convinced these sock liners were amazing blister prevention, I decided to get a pair. 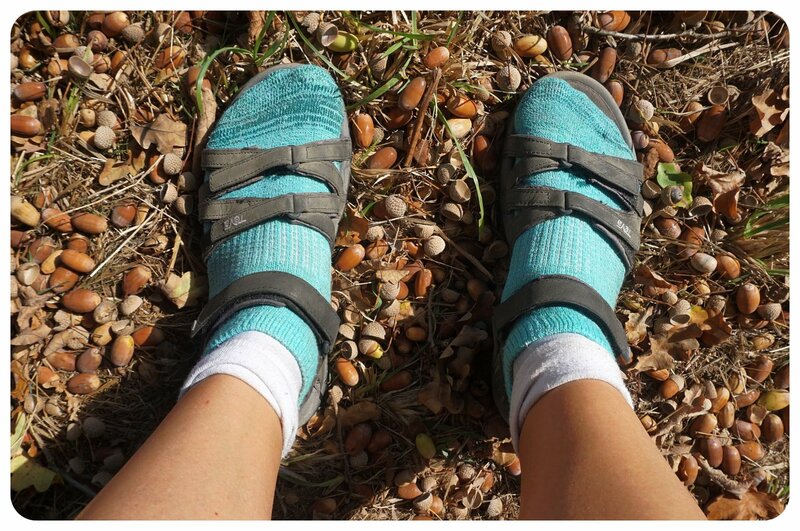 After a few days on the Camino, I wished I had bought more than just one pair because having only one pair meant I had to either hand wash them every day or just wear dirty socks for a few days. It worked out fine with just one pair but if you need fresh socks every day, pack two pairs of sock liners. They also prevent your main socks from smelling. 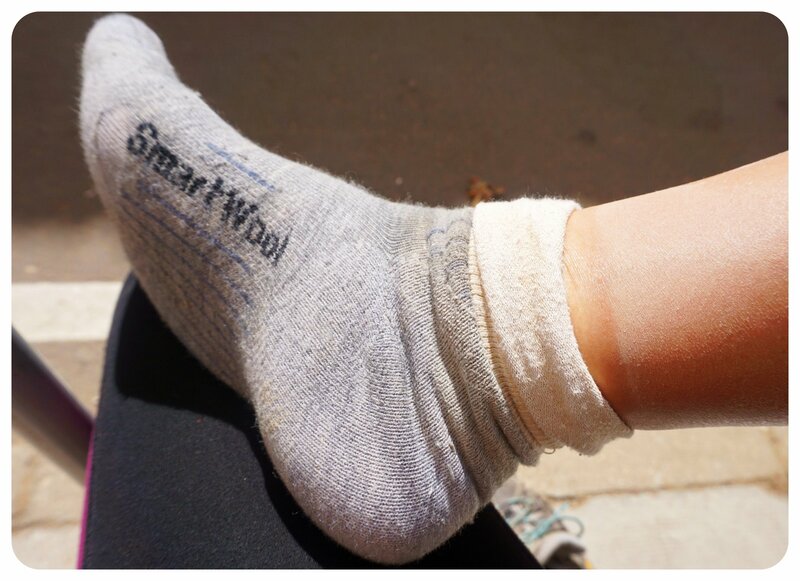 Above the sock liners, I always wore SmartWool hiking socks. 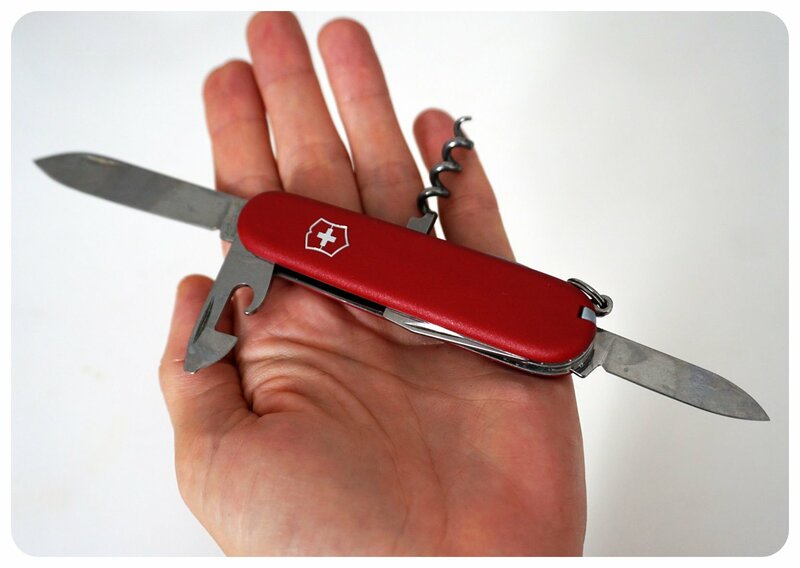 I actually bought a brand new Victorinox Swiss Army Knife for this trip, but then I remembered that I was flying with carry-on only, and pocket knives have to be checked in, so I ended up not bringing it. I definitely could’ve used it to cut fruit, bread, cheese, tomatoes and avocados when I was making sandwiches. I tried to get by with a plastic knife, but a proper Swiss army knife would have made cutting fruits and vegetables so much easier. Since you’ll probably be snacking on fruits and will make a sandwich yourself at some point throughout the hike, a Swiss army knife is a great item to bring – also for all its other functions, like the cork screw and small scissors. I used a 35l Lowe Alpine backpack which I’ve had for a few years and which I used when I hiked the National Trail in Israel a few years ago, and for that it worked fine – but back then, I only hiked for eight days. I wouldn’t use this particular backpack again for a five-week hike, and here’s why: There were no outside pockets other than a net on the front of the pack. I really needed a side pocket for my water bottle, for example. I would’ve also appreciated a hip belt pocket and an additional zipper pocket on the front as I’d seen on other packs, where I could’ve stored my guidebook, notebook and pilgrims’ credentials in, instead of having to open the main pack every time I needed to get them out. I wouldn’t opt for a backpack that holds more than 35l, because the more space you have, the more likely you are to fill it. But even one or two kilos can make or break this hike – and you really don’t need much. Make sure not to fill up your backpack all the way – I often added snacks, my jacket when it got warmer later in the day, and eventually my hiking shoes, whenever I changed into my hiking sandals. When purchasing a backpack for a long-distance hike it is important to try it on. Pay your local outdoor shop a visit and try on different models, see how they fit, where the straps are, walk around with it and put some weight inside. You’ll quickly notice if there’s anything that doesn’t fit right for the size of your torso. You can find some great information on things to consider when choosing a backpack in this article, but if you have an REI store near you, even better: they’re great at helping you find the perfect backpack for your body size. One thing that a backpack should have for sure is a built-in rain cover, which you’ll need, and having it built in saves you the hassle of having to buy one and to pack it. Together with the backpack, your shoes make up the most important element of the things you bring on this hike. 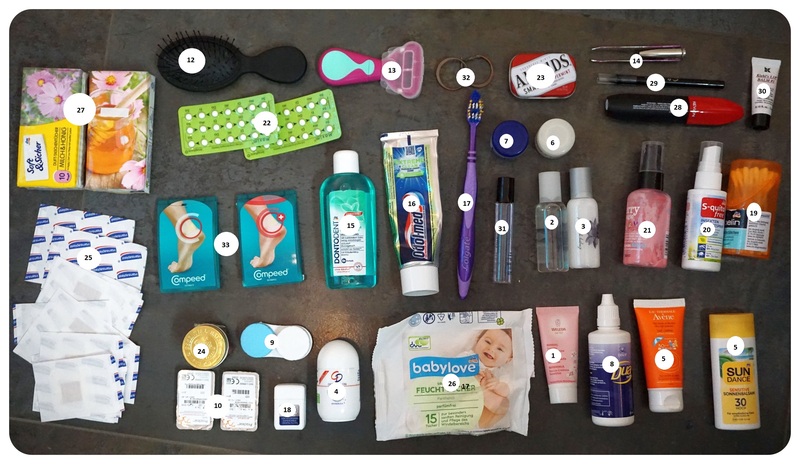 These are the items that can either make or break your hike, and these are the two things I would recommend not skimping on. 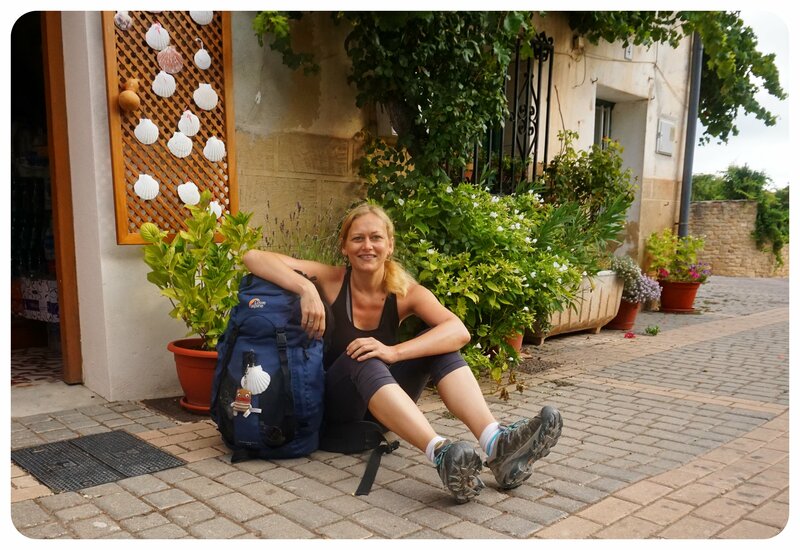 I’ve seen all kinds of shoes on the Camino – from bulky leather hiking boots to trail running shoes and even regular sneakers. Which kind of shoe you choose depends on your personal preference – I find ankle boots too heavy, for example, whereas others do need the additional ankle support. Whatever shoe you go for in the end, the most important thing is to break it in. 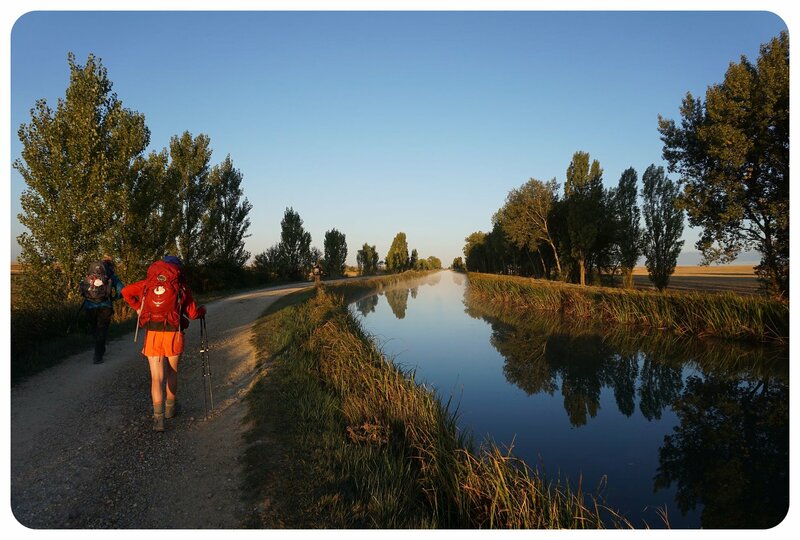 Make sure to do at least one considerable hike (15+k) in the shoes that you’re planning to wear on the Camino, and it’ll give you a good idea if you can comfortably walk 20 to 30k per day in them. This article has some great advice on how to choose the right footwear for the hike. I chose the Keen Targhee ii hiking shoes because they’re much wider than my usual hiking shoes (I’ve used Vasque and Salomon in the past, which are a lot more like trail running shoes), and I had a feeling that my feet, which aren’t used to closed shoes anymore since I walk in flip flops and sandals for the most part of the year, would swell a lot. And they did. I was so glad that I hadn’t returned the shoes, which I almost did, thinking they were a little too big. Another reason I chose them was that they’re waterproof, something you should definitely have for this hike. Overall, I found them a bit bulky, but not as bulky as many of the other hiking boots I saw other pilgrims wearing, and at 357.2 grams/0.78 pounds, they didn’t add too much weight to my pack when I was carrying them, and I never had any problems fitting them in there. I did not plan on bringing hiking shoes AND sandals on this walk, but after reading how many people had to stop walking because of severe blisters, I decided at the very last minute to buy a pair of hiking sandals to change into should I develop sore spots. I went for the Teva Tirra W‘s because of how light they are (around 600 grams / 1.3 pounds), because they’re not bulky and don’t take up a lot of space, and because they are waterproof. I’ve never worn hiking sandals before and didn’t know how they’d work out for me, but I can now say that I wouldn’t have been able to finish the Camino had I not bought these sandals. Every time I couldn’t take the pain my hiking boots were causing me, I was able to change into my Teva’s and continue walking in them. Sandals gave my toes the space they needed, as well as some air. The sandals don’t give your feet the same firm grip and support that they get in boots, which is why I couldn’t wear them for too long, but I was fine with them for about half a day, and I wore them for a full day a couple of days which was doable, but I definitely felt it in my ankles, knees and hips. Not the sexiest look, but it got me to Santiago! I knew I had to pack some flip flops or other slip on sandals for the afternoons. 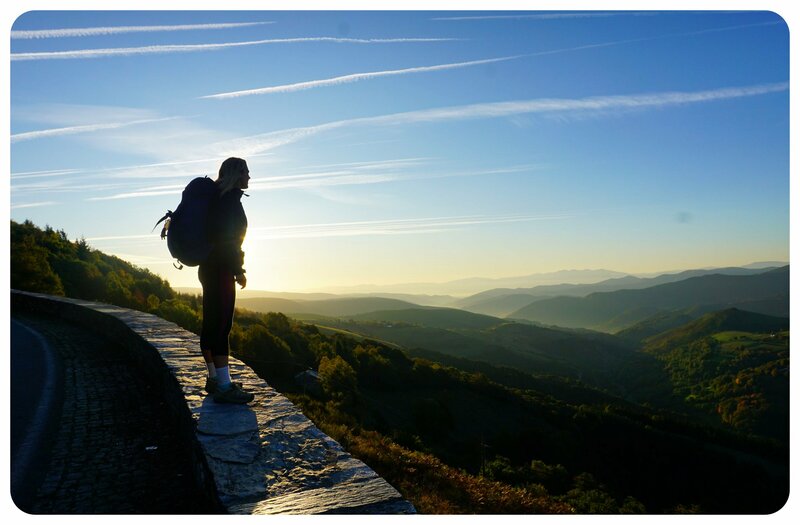 Remember that you’ll only be hiking for seven or eight hours per day (on average) – the rest of the day you’ll be spending at your albergue or sightseeing. You don’t want to put your hiking boots / hiking sandals back on once you take them off after a long day of walking, trust me. I chose a pair of flip flops with a soft sole, and very soft thong straps to avoid rubbing. Flip flops with a memory foam foot bed would also be great. 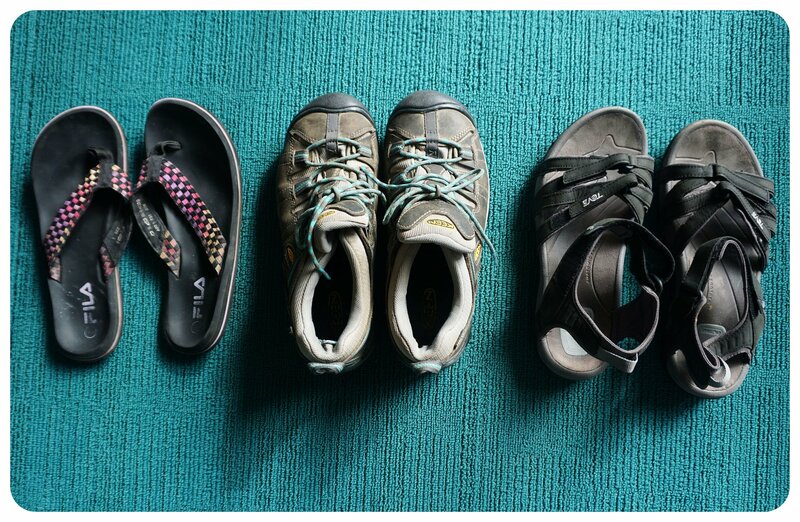 If you don’t like flip flops, buy slip-in sandals, because you’ll also need these shoes for the showers in the albergues and you’ll want a shoe you can take off quickly. I fit all of my clothes in one small packing cube, which is part of a 3-piece packing cube set I’ve got. I highly recommend putting all your clothes in a packing cube (no need to spend much on those, there are plenty of cheap packing cubes on Amazon) – It was great not having to rummage through my entire backpack every time I was looking for a clothes item, but having them all in one place. The packing cube with my clothes on the right, my rain gear in the middle. My travel guide as a reference for actual size. As I mentioned earlier, there were a few days when we started walking in very cold temperatures (38°F/3°C), and I started to think I’d need to pick up a fleece or a warmer jacket along the way. But then the weather got warmer again in the second half of September and I ended up not needing any additional clothes – on the contrary, I would’ve hated carrying around another item of clothing. Having two pairs of yoga pants to switch between, as well as two tank tops, was perfect, and whenever I did need an additional layer, I wore my long-sleeve shirt. The leggings & dress/shirt outfit for the cities worked well, and I am glad I resisted the temptation to pack jeans – they’re just too heavy. There were other pilgrims who did have jeans with them, or even a fancy outfit, but those were usually people who had their backpacks sent ahead. It depends, of course, what time of year you’re hiking. 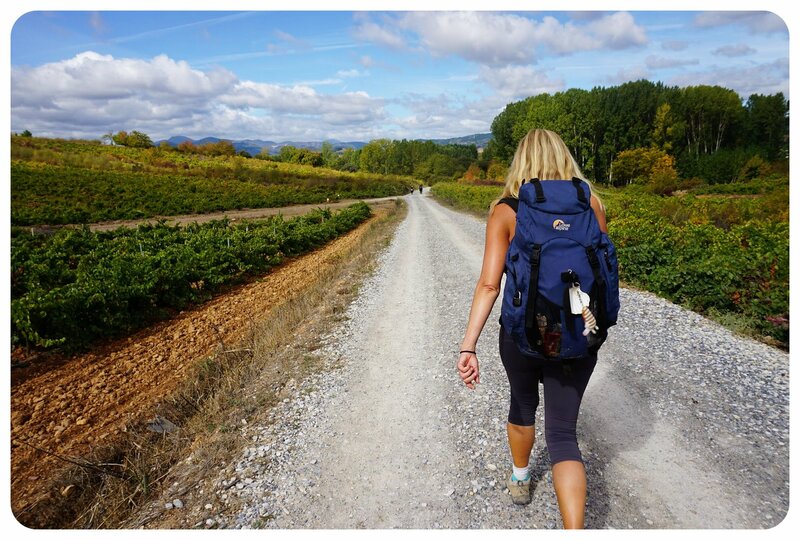 If you are walking the Camino in the late fall, you’ll need much warmer clothes than I needed in September, but if you are walking in the summer months, you’ll probably want to pack some shorts instead of the three-quarter yoga pants like I was wearing. A few Aspirin, Ibuprofen and Paracetamol. Maybe 20 pills in total. Of course I could have done without the mascara and eyeliner, but I wanted to have at least a little bit of makeup for the days I spent in big cities. I definitely needed the lip balm though, especially in the meseta (the central plateau), where my lips were always very dry. The tissues were needed whenever I had a runny nose (cold, windy days). The only things I needed to re-buy throughout the hike were shampoo, conditioner and shower gel, and I picked up an additional lotion to moisturize my feet every night before I went to bed. I did not bring any medicine, only some pain medication, because I knew I would be able to get anything I might need at a Spanish pharmacy. The mosquito repellent I brought is the only thing in my toiletries bag I never used. Are two portable chargers necessary? Whenever we stayed in a bigger dorm, I struggled finding a free power outlet to charge my electronics. On those days I was happy that I had a spare power bank because I could use one to charge my Kindle/camera, and the other one to charge my iPhone. The myCharge can charge two items at the same time though, so the myCharge by itself would be sufficient. (Side note: Thanks to the integrated cables of the myCharge, you also don’t have to take an additional short charging cable.) Since my phone battery dies quickly, however, for me it was a relief to know I had a spare power bank to use if needed (which did happen). I would not recommend traveling only with a short cord – I brought this cord as an additional one to use with my Anker portable charger, but ended up having to rely on it because I forgot to pack my long charger cable. Since most albergues have their power outlets halfway up the wall, rather than near the floor, I couldn’t charge my phone at these outlets. And even if there was a charger right by the bed, the charger cable was too short to be able to use the phone while it was charging, which was annoying. I don’t think it’s necessary to carry a global hotspot with you unless you are planning to work throughout the Camino. 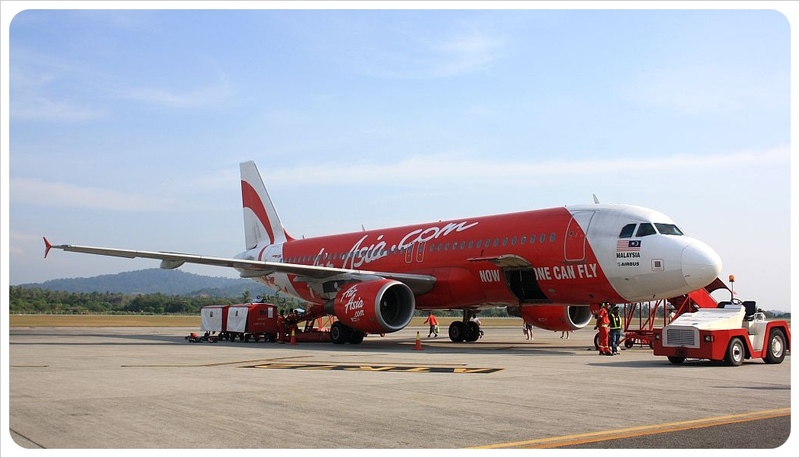 If you are planning to rely on your smartphone for email, social media, and internet, a local SIM card is enough and it’s cheaper (a day pass for the Skyroam is US$8 ). A local SIM card is also useful so that you can call albergues to reserve a bed, which we did almost every day. I am glad that I brought this USB charger in addition to my big wall plug which has a regular power outlet (to charge my laptop) as well as two USB chargers. Sometimes there was no space in a shared plug for this big plug, but there was always space for my small USB plug. Whenever we had a private room, I could use this one to charge my portable charger and my other plug to charge my laptop/Kindle/phone. Next time I would buy a charger with two USB ports though – for one, you can help out other pilgrims by sharing the charger in a dorm with limited power outlets, or you can charge two devices at once. Ear plugs are a must if you’re a light sleeper! Even when we stayed in private rooms, the walls were often thin enough for every sound to be heard through the walls. If you need it to be completely dark while you sleep, bring an eye mask as well. You may go to bed before the lights are turned off, or want to sleep longer than 6am, when in most dorms the lights are turned on. The double zip waist bag was given to me as a gift for the trip, and I wasn’t sure if I was going to use it or not, but I took it. And I am so glad that I did, because I ended up using it every single day! I stored my passport in there as well as my cash (I usually got out large amounts of cash at the ATM), as I wanted to make sure I was carrying the most valuable items on me. Whenever I slept in a dorm room, I put it under my pillow at night – it’s small enough to put there without it disturbing you while you’re sleeping. I used my waist bag all the time! I would recommend against bringing a full wallet with all of your cards – take only the ones you plan on using, and be aware that barely any of the cafes, restaurants and albergues accept credit cards. You’ll need cash for all your meals, and if you are staying in pilgrims hostels, you have to pay them in cash as well. 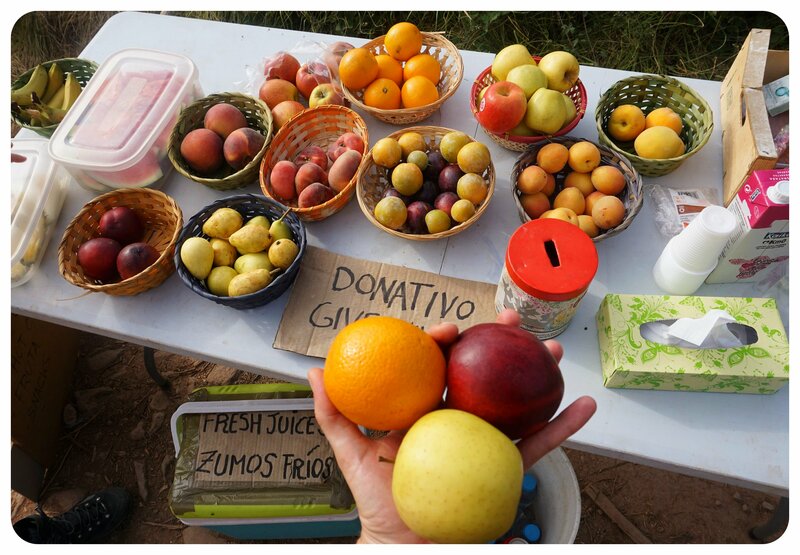 Sometimes I needed additional change for a donation to a fruit stand on the side of the road or for a stamp, or a small church donation for a stamp. You will carry a lot of coins, which is something to consider especially if you’re not from Europe – there are considerably more coins here than in the States, for example. I nearly forgot to pack one, but luckily it occurred to me that I’d need a small bag for the afternoons when I’d be sightseeing or working on my laptop in a cafe. 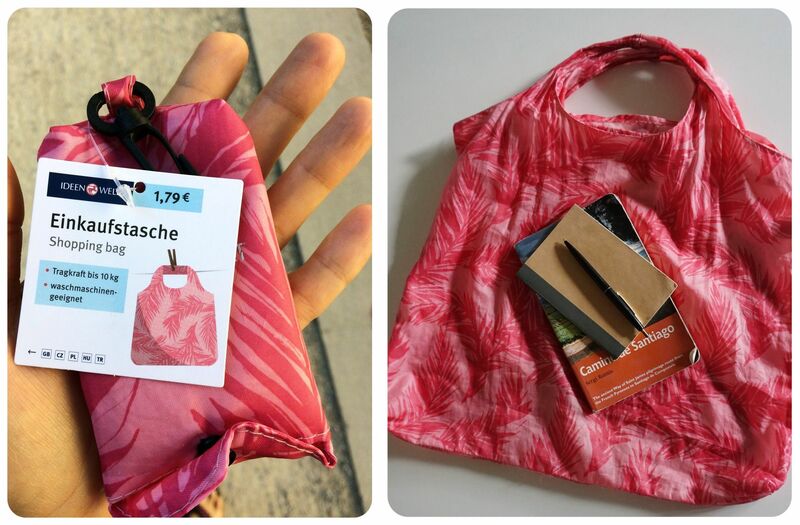 I picked up a cheap one in a supermarket for less than two Euros – ideally I would’ve liked to have a bag that was a little nicer, but this one did the job. There are plenty of cute expandable tote bags on Amazon. Of course you can also pack a small handbag, but a) it takes up more room and b) it won’t fit everything you may want to take with you. 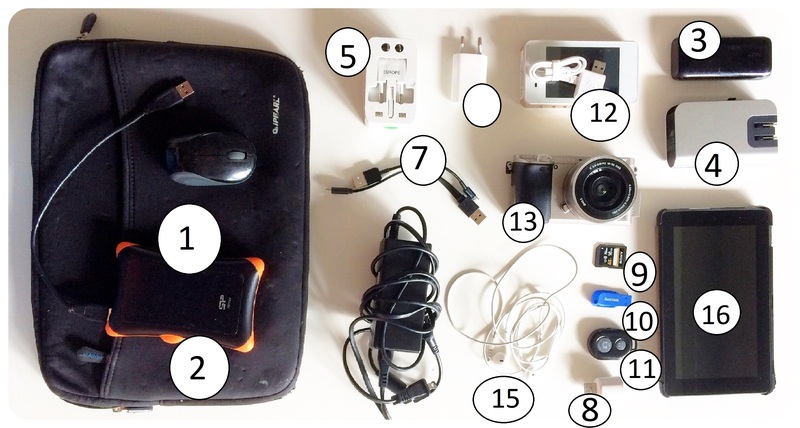 Mine fit my camera, guidebook, water bottle, notebook, jacket and even laptop. 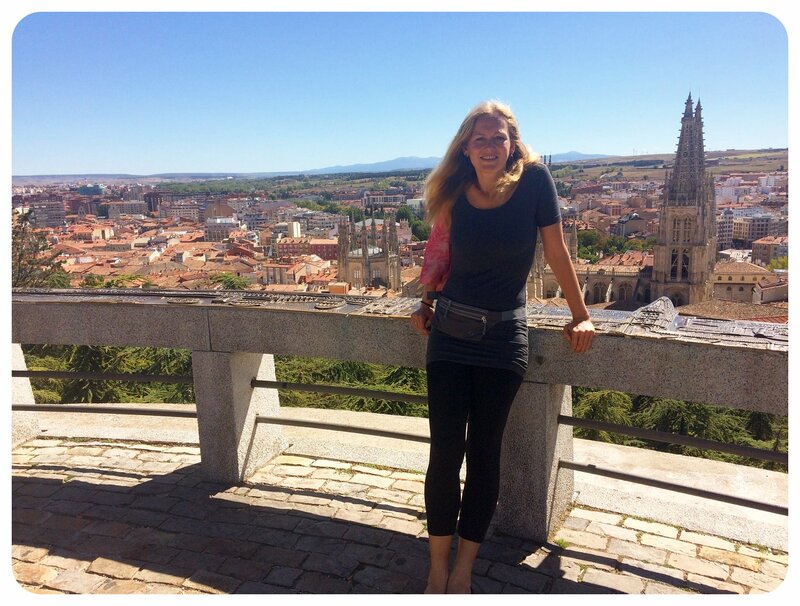 I was torn whether I should bring a guidebook or not – I could rely completely on apps (there are several Camino apps), or even the internet, or I could bring an old-fashioned guidebook. If you’ve been reading my site for a while you will know that I love guidebooks, and so I ended up bringing one. One of my friends who had walked the Camino said she enjoyed reading additional information about sights along the way and the towns we were passing through, and I knew I’d also appreciate this. 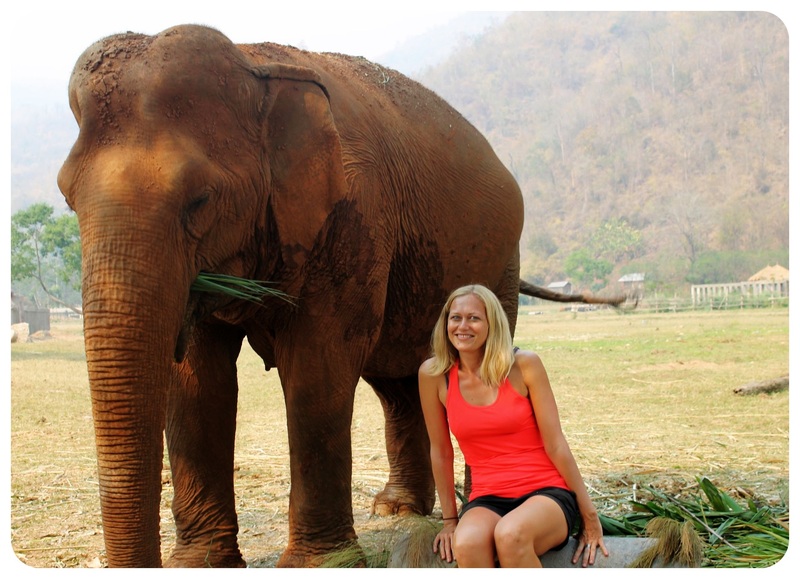 I didn’t once regret bringing the guidebook – in fact, I used it more than anything else. I usually read up on the stage ahead in the morning, and I used the handy maps to see where there were villages or towns along the way to plan out my breaks. I wouldn’t have wanted to rely on apps for this, and most of them require data anyway, which I only had access to when I was connected to wifi. There are smaller guidebooks than the one I brought, including the Michelin guidebook which seems to be very popular but only has the daily route mapped out with brief details on albergues and other facilities in each town. Another popular guidebook is John Brierly’s Pilgrim’s Guide to the Camino, which the majority of people used. 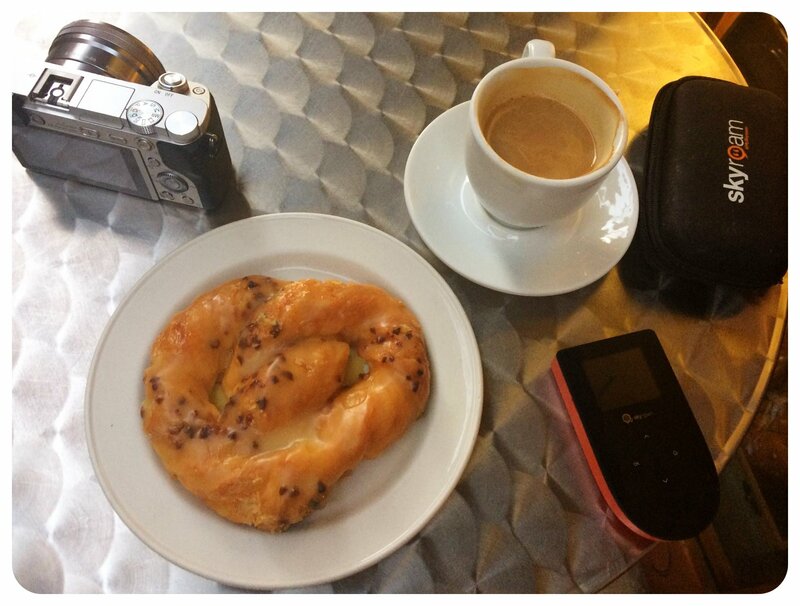 One thing to consider when choosing a guidebook is how many days you’re planning to walk – my friend’s Michelin guide breaks up the way in 34 stages, for example, while mine has only 30 stages to Santiago, i.e. considerably more kilometers per day. I saw one guidebook that breaks up the way into 42 stages, so decide how many kilometers per day you’re comfortable walking when choosing a guidebook. Since most of the guidebooks can’t keep up with the ever changing (and rapidly growing) hostel scene along the way, I recommend downloading the BuenKmino app in addition – it is supposed to let you book beds in each place, which we weren’t able to do (some error in the app, which I hope they will fix eventually) but the hostel listings (including for places that aren’t main stages) here are the most comprehensive I’ve found anywhere, and include prices, number of beds, and a phone number, which we used to make reservations. 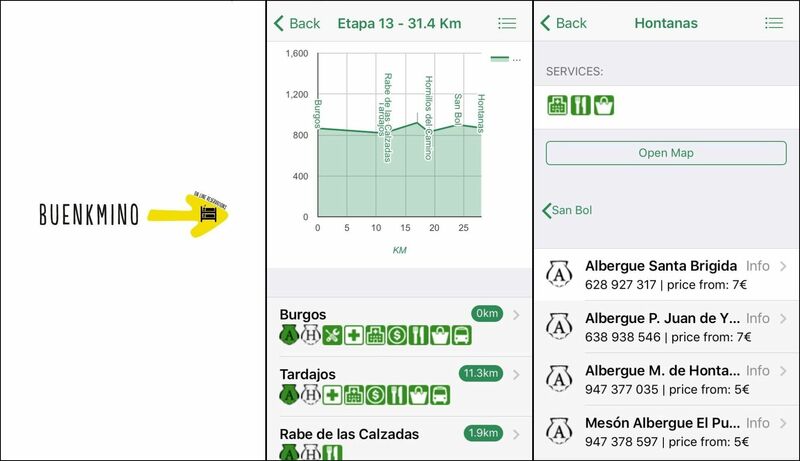 I personally used the app every day, not only to look up albergues, but also because I found their stages very helpful (how many kilometers in between each village you’re passing through) and their kilometers to be the most accurate. When packing your backpack, make sure to weigh it with the water you’re planning to carry. There were some hikers with massive 100oz (three liter) water bladders, which when filled up completely, actually weigh over three kilos (around seven pounds), which is a lot of additional weight. I was fine with my one liter bottle, which I refilled regularly at the fountains along the way or when we stopped at a café (they are usually very pilgrim-friendly and refill water bottles with tap water). If you think a 1-liter bottle isn’t enough – especially if you are walking during the hotter summer months – consider packing a collapsible water bottle, they fold up really small and don’t weigh much (around 33g / 0.07lb). You’ll most likely pick up some snacks along the way too, and I was surprised to learn that three pieces of fruit add up to nearly one kilo. That, plus some trail mix, an avocado, a boiled egg and a bar of chocolate, which also add up to around one kilo, along with the water, can easily add up to a total of three kilos. I brought two bags of my favorite trail mix from Trader Joe’s, not taking into consideration that each bag weighed one pound, so combined they added nearly one kilo (32 oz) to my pack! Considering you’re only supposed to carry one-tenth of your body weight (in kilos), the food and water alone would be nearly half of what I am supposed to carry in total (no wonder I ended up carrying nearly twice the weight I was supposed to carry!). It is also possible to send stuff all the way to Santiago, so if you’re walking the Camino as part of an extended Europe trip, you can send all the stuff you don’t need on the Camino straight to Santiago and have it wait there for you when you arrive. El Camino Correos works with the official Spanish Post Office and the prices to store your backpack/suitcase in Santiago for you are very reasonable: the first 15 days it is stored for free and after day 16 they charge €1 per day storage costs, plus €26.60 shipping costs per 25 kilo suitcase (sent from anywhere within Spain). There are several other companies that offer this service, too. Am I able to send my suitcase from albergue to albergue for the 3-5 euros you described or is this only for backpacks? And only have the option of sending my suitcase to Santiago? Thank you for all your helpful advice! Hi Mayra, yes, I think the price is per piece of luggage, no matter if it’s a suitcase or a backpack 🙂 I think you can send it all the way to Finisterre, or what destination were you thinking, if not Santiago?